EverFlo Oxygen Concentrator without OPI (Oxygen Percentage Indicator) - SHIPS FREE! 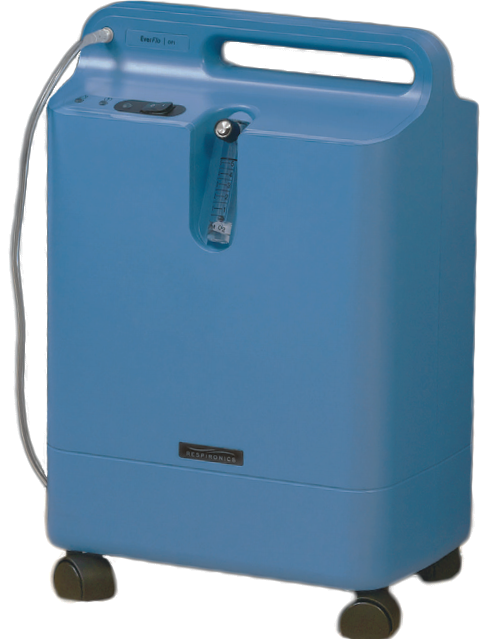 EverFlo Oxygen Concentrator with OPI (Oxygen Percentage Indicator) - SHIPS FREE! Select the right EverFlow Home Oxygen Concentrator System for you. 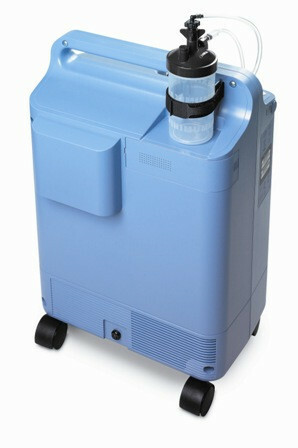 Are you looking for an Everflo Oxygen Concentrator for sale? Look no further, Vitality Medical has you covered. 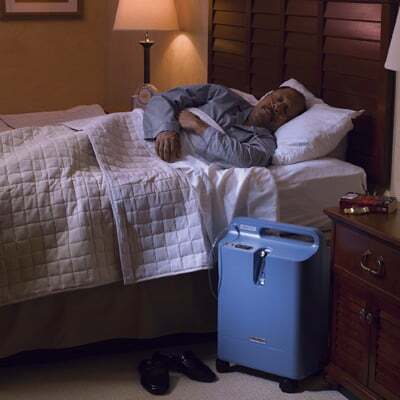 The Philips Respironics Everflo Oxygen Concentrator 5 Liter is a lightweight concentrator, weighing only 31 pounds and is designed for home use. 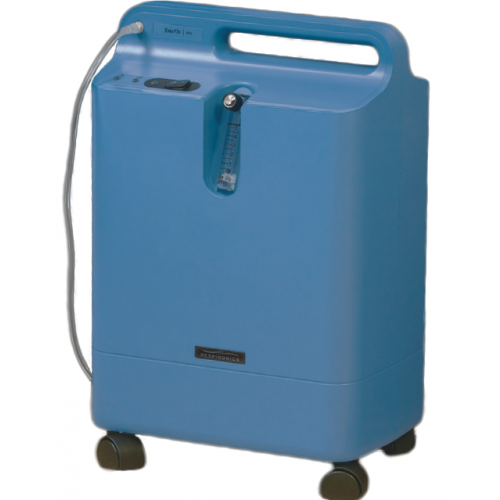 See the Oxygen Concentrator Comparison Chart and Reviews. 5 Liter Concentrator and 3 year warranty. Everflo OPI Concentrator comes with Oxygen Percentage Indicator (OPI) and 3 year warranty. 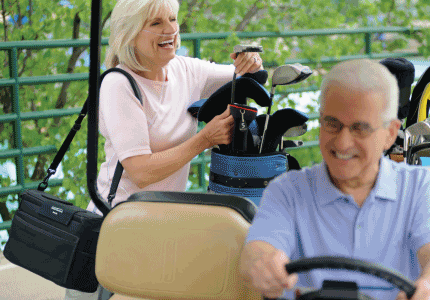 Respironics is one of the leading brands in oxygen concentration and there is no one more qualified than Vitality Medical to bring you a full selection of Invacare Oxygen Concentrator products. 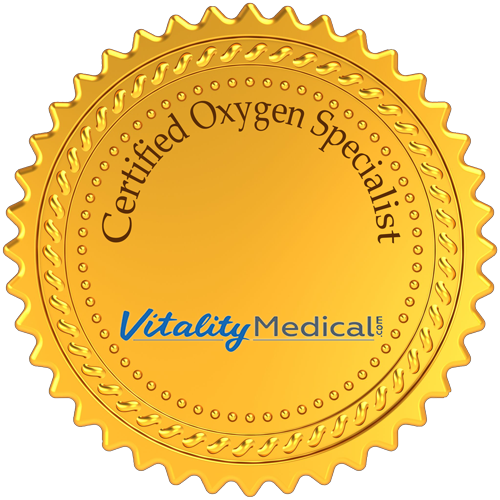 Founded by a registered nurse, Vitality Medical makes sure that our team members are all internally certified to help customers, ensuring that our expertise sets us above the rest. Tested every six months, Vitality Medical Certified Oxygen Concentrator Specialists answer 50 rigorous questions in 35 minutes and each test must be passed with at least a 94% accuracy or better. All this combined with our Lowest Price Guarantee are exactly why you should trust us to help you get the best concentrator that works for you and your budget. If you are unsure about the concentrator that might be right for you, or you just need a loaner for a vacation, try our rental program. The majority of our concentrators can be rented to try out, or for a short recovery time, and plenty are FAA-approved to be rented for travel. Many individuals already have their own home concentrator, which is why we offer cost-effective rentals for both Continuous Flow and Pulse Dose portable concentrator machines. We also want you to be 100% satisfied with your new concentrator. If for any reason it doesn't meet your satisfaction, let us make it right. We'll buy it back from you and help you get the perfect machine that fits your needs. 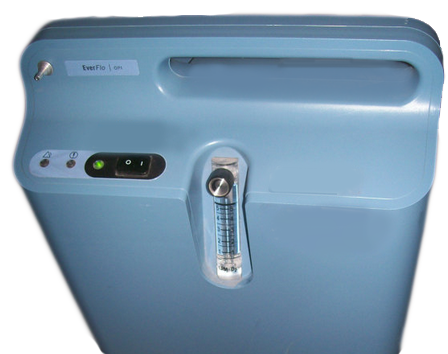 Respironics EverFlo is a long-life Stationary Oxygen Concentrator. Designed for individuals looking for something more from their oxygen concentrator, this oxygen machine provides Respiratory Therapy for those who may require 5 liters or less of oxygen flow. 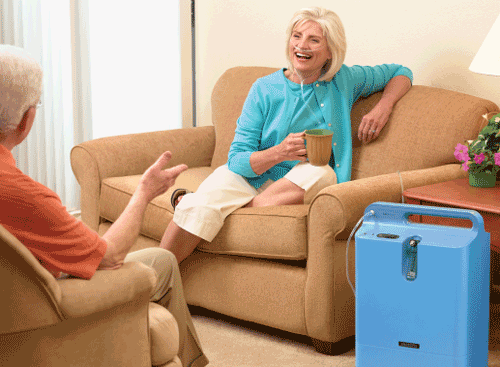 Unlike most home oxygen concentrators, the EverFlo is lightweight at only 31 pounds. The EverFlo is quiet, emitting less than 45 dBA. This concentrator features a much more compact, ergonomic design that takes up much less space and produces less heat while using less power, all without the risk of losing performance. The EverFlo Oxygen Machine is available with or without an oxygen purity indicator (OPI). The user-friendly design of the Respironics EverFlo Concentrator makes life simpler and easier for oxygen users. Respironics' small, quiet design uses less electricity, cutting costs compared with other competitors. The EverFlo features a compact, non-medical design that stylishly fits the user's surroundings. Heavy and bulky oxygen tanks are not necessary so you can avoid coordinating and scheduling oxygen resupply. Respironics EverFlo is very low maintenance. The internal maintenance-free dual filtration system means that only filter changes are required by homecare providers every two years! The EverFlo features a recessed flow meter and a metal cannula connector to prevent any accidental breakage. The optional Oxygen Percentage Indicator accurately and precisely measures the concentration of oxygen being dispensed. This indicator can be vitally important to strict oxygen therapy dosage requirements. 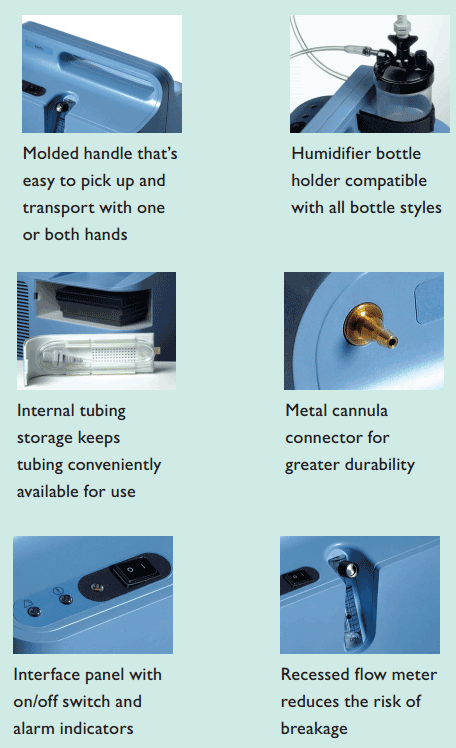 Respironics has also reengineered the humidifier bottle connection, making the EverFlo much simpler to use. Click on the following link to view a large diagram of the Respironics EverFlo Features. Respironics also manufactures the EverFlo Q which is a quieter version of the Respironics EverFlo Concentrator. A comparison chart of the leading Home Oxygen Concentrators can be viewed at Comparing the Top 5 Home O2 Concentrators. Everflo Brochure offers features and benefits of this Respironics Concentrator. Everflo Trouble Shooting Guide matches problems with what to do to correct the problem. Everflo Alerts and Alarms Guide matches the type of alarm with the action your should take to correct the fault. 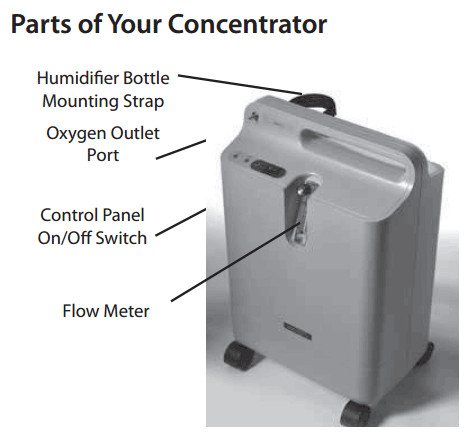 Phillips Respironics webpage for the EverFlo 5 Liter Oxygen Concentrator System. Everflo Warranty provides information on Phillips Respironics limited warranty for the Everflo Concentrator. Vitality Medical also carries the top selling portable concentrators for oxygen therapy users who wish to live a more active lifestyle. Many oxygen users who require low dosage, also use their portable machines as their home oxygen system. When these users travel, they bring their portable oxygen supply along with them. Some of these portable concentrators weigh less than 10 pounds and have small profiles. Vitality Medical also has oxygen masks, oximeters and oxygen therapy accessories you can purchase online for home or office delivery. 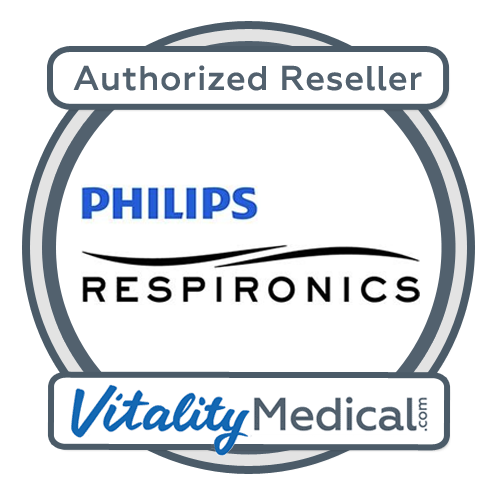 Additional Note: MSRP for Respironics EverFlo Oxygen Concentrator with Full Local Support is $2,252, with Limited Support $2,052, or with Vitality Medical's Special Online Support $1,852. To be compliant with current FDA regulations, we require a prescription for selected Portable and Home Stationary machines and Pulse Oximeters. Prescriptions are NOT required for replacement parts and accessories. If a prescription is required for an item in your order we will inform you of the requirement and ask you how the prescription will be provided. I get moisture build up at night in the feeder hose. It accumulates in the nose piece and makes a gurgling sound. Mostly when i sleep on my side and it wakes me up. I try to turn the volume way up to blow it out but never really get it all. How can i keep water out of the hose? Fyi i dont use the moisture bottle as it may add to the problem. Is there any type of case or carrier to take the concentrator with you on a long trip? There currently isn't a cover available from the manufacturer. For safe travel on a plane, we recommend contacting the manufacturer and the airline for proper procedures. Do I have to have a prescription to purchase this machine? This item requires a prescription before it can be sent out to you. Does health insurance pay a percentage of this product? How many hours will these machines last ? mine has 12500 hours and still going. Also, I am confused about changeling a filter-does this machine have a filter ? The concentrator is guaranteed to last three years. The manufacturer does not state how many hours the concentrator will last as part of its guarantee. We live at 8300 feet and I noticed the elevation limits on the Invacare Perfecto 2 is 8000' and the Respironics Everflo is 7500 feet. We are looking into buying a unit, but the elevation thing is a concern. There are several home and portable oxygen concentrators able to operate at higher altitudes. Many Inogen models, our Visionaire line, the SimplyFlo, EasyFlow5 are just a few examples of what can be used at 10,000 feet. Our customer service agents are available to answer any questions about operation altitude. Is there a back up battery if the electric goes off? There is no internal back up battery if the power goes out. Is a prescription required for the purchase of a oxygen concentrator? Oxygen Concentrators requires a prescription to be sent in before ordering through our website. How do we connect the oxygen tube to the water bottle on the top of machine? DOES MEDICARE PAY TO THIS AND IF THEY DO, HOW MUCH? Hello Mr. Penepacker: We do not work directly with Medicare because we are an online retailer. If you are seeking reimbursement, you will need to contact your local Medicare office either before or after placing your order. I hate this machine. It works like a heater that I must keep on. Heats up my home and Jacks up my electric bill! Small footprint, could be quieter but the new Q model improves that. virtually maintenance free. Occasional problem with stopping and beeping with no apparent cause. My husband goes to bed before me and every time I turn on my respirator, the beeeeep is so long and annoying it wakes him up. It is too large for taking on trips and is so noisy I have to put a pillow over it to muffle the sound being careful not to block the intake. I want a quieter, smaller unit without the beeep! The EverFlo works well. No complaints. After being asthmatic for 2 years, I decided that I need to really take my therapy seriously. 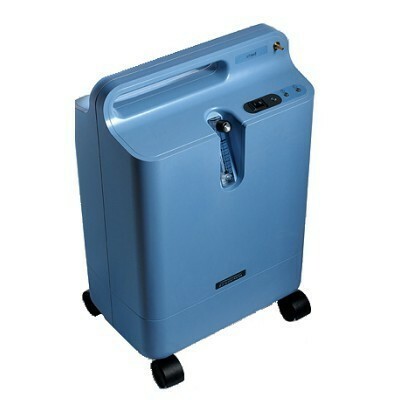 I frequently have to make sure that I lug around an oxygen concentrator when I travel, just for emergency. With this oxygen concentrator that problem was solved. I really love this product! This unit is very quiet. I run it at night and it does not bother my husband or me at all. It is very easy to use and can easily be moved from one room to another. You can watch Tv and you dont have to hear the oxygen concentrator in the back ground.